Stems: Erect, often much-branched above, stiff, leafy, mostly glabrous. Leaves: Alternate, simple, sessile, linear to linear-lanceolate, 1/2 to 1 inch long, to 1/6 inch wide; margins entire to slightly toothed; tips pointed; mid-stem leaves usually with prominent glands at bases. Inflorescences: Panicle-like, open, somewhat flat-topped, mostly terminal. Flowers: 1 to 2 inches wide; sepals 5, lanceolate, overlapping, conspicuously glandular-toothed; petals 5, yellowish orange, reddish brown veins at bases; stamens 5, anthers yellow; styles 5, united below middle. Fruits: Capsules, thick, egg-shaped, 5-segmented, each segment 2-seeded; seeds small, flattened, brownish. 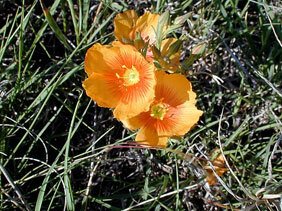 Habitat: Dry sandy or gravelly prairies. Comments: In Kansas, these plants are often less than 6 inches tall. The petals remain only 1-2 days. Jean Louis Berlandier, (1805-1851), for whom the plant was named, was a French botanist who worked in Texas and Mexico.